Each year, it seems that stadiums are getting bigger, more extravagant, and more expensive. But where does the money come from to build these massive monuments to professional sports? A significant portion of the funding (on average, more than 50%) for each new stadium constructed after 1990 was in the form of some sort of public subsidy, whether it was from municipal, county, or state governments. The average subsidy for NFL stadia was nearly 70% of the total costs of construction, greater than the 67% average in MLB and 51% in the NBA. Previous research (by Harvard’s own David Tannenwald) suggests that a credible threat of relocation seems to be the most dramatic and persuasive argument a team can make when negotiating with a city for a new stadium. Consequently, the league that allows the most freedom with regards to relocation should receive the greatest portion of public funding for construction of new stadiums. However, each league regulates relocation in a different manner. The antitrust exemption that MLB enjoys grants it the greatest authority among the three major leagues to restrict team movement. The NBA and NFL have similar rules, but case law that has developed over the years has historically favored NFL teams (rather than the league) in relocation disputes. NFL rules regarding television contracts and player salaries make it easier for smaller cities to compete for an NFL franchise, increasing the competition for a franchise and thus the price (in terms of the subsidy). Since NFL teams have the most freedom to move from city to city, and more cities can compete for NFL teams than NBA or MLB teams, it follows that NFL teams should receive the largest subsidy (in terms of percent of total cost subsidized, not absolute dollar value). 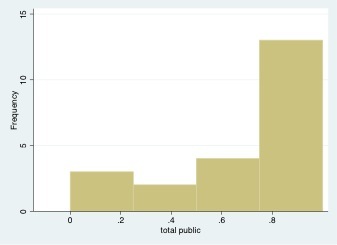 The following two charts show the distribution of subsidies among NFL and non-NFL stadia. As is evident, each of the distributions is left-skewed, although the NFL’s is more so than the non-NFL distribution, meaning that the a greater number of stadia in the NFL are at the higher end of the spectrum. In order to figure out whether or not differences in league regulations significantly affect the subsidy level in each of the three leagues, I looked at all stadium subsidy data dating back to 1990 (about 75% of stadia currently in use were built after 1990). Subsidies here are defined as a percentage of the total cost of the facility subsidized (total subsidy $/ total upfront construction $). The main independent variable is a simple dummy variable (NFLDV), which takes a value of 1 for an NFL team and a value of 0 for a non-NFL team. I used the team value in the year the facility was built (Team Value Yr. Built, in $million) to control for differences in team value. I fit the data using a linear model because of the dummy variable. As is evident, the presence of the NFL dummy variable predicts a substantial increase in the size of the subsidy. Additionally, the team value variable (Team Value Yr Built) predicts that as team value increases, the size of the subsidy decreases. Both of these variables are significant at the .05 level of significance, as is the model as a whole. The model’s R2 value was 19.8%. This model, however, is not a useful predictor of the size of the subsidy for a particular facility. In fact, the models’ prediction differs from the actual subsidy size for each of the facilities I studied by an average of 25%. It is useful in confirming the hypothesis, that in general, NFL regulations allow teams to draw more concessions from local governments by increasing their bargaining power. Paul Brown Stadium in Cincinnati is a perfect example of the NFL regulations contributing to higher subsidies. The Bengals’ ownership was able to credibly threaten to relocate to Baltimore in order to coerce Hamilton County to provide an almost entirely publicly subsidized stadium to replace the aging Riverfront Stadium, which was shared with the Cincinnati Reds (MLB). 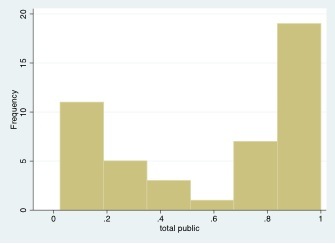 As a second part of this study, I attempted to determine the effect of partisan affiliation of local government officials (mayors, governors) on the share of the subsidy. The results from that study will appear in Part II later this week. * All subsidy data is from Judith Long’s Ph.D Dissertation: Full Count, as well as the Marquette Sports Law Institute (Matthew Mitten). Franchise value data is from Rodney Fort. If you have not read “Field of Schemes,” I think you would find it interesting.